Review posted April 1, 2019, from a library book. Schwartz & Wade Books, 2019. 32 pages. 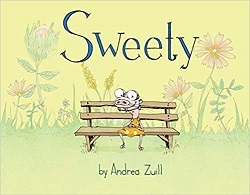 Sweety is a picture book about Sweety, a naked mole rat (who wears clothes) with unconventional habits and preferences. She’s an oddball and has trouble making friends. I wasn’t crazy about it, not being particularly taken with the art, and sure I’ve heard this story before. But then, a scene resonated! I realized: This is a picture book for people who have tried online dating! Aunt Ruth said that being different was one of the best things about her life, and that if you stayed true to yourself, you’d find your people. Were there really people out there for her? How would they recognize her? How would she recognize them? Was there a secret handshake she’d have to learn? She really hoped there was a secret handshake. Sweety wondered how many times she’d been close to one of her people and not known it. What if she stepped it up a notch? Would her people be able to spot her more easily? [Shouting through a bullhorn:] My name is Sweety. I like dancing, mushrooms, and rainy days. You too? Need to find your people? Maybe we’re a match! Flyers are available. [Picture of Sweety in a mushroom costume dancing with fireworks.] Or would she just seem desperate? For now, she’d trust Aunt Ruth, continue to do her favorite things, and be herself. And maybe she’d try a couple of new hobbies just for fun. After all, being Sweety wasn’t so bad. The book does end with Sweety meeting a fellow mushroom-lover and making a secret handshake. But I now have a go-to book for those times when I feel like “my people” just aren’t noticing me. A picture book for online dating! I’m going to continue to do my favorite things and be myself. And, okay, kids can get a nice message out of it, too.